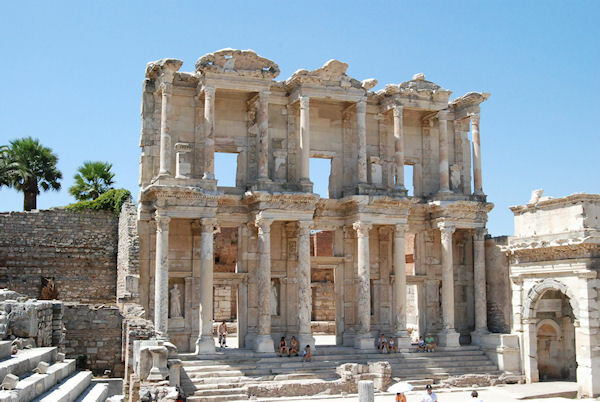 This full day excursion visits the most exciting and historic sites of the region: the House of the Virgin Mary, Ephesus Open Air Museum, the Archeological Museum of Ephesus and the Basilica of St. John. You will visit the shrine thought to be the House of the Virgin Mary. Tradition states that Mary, accompanied by John the Apostle, came to Ephesus at the end of her life. In 1967, Pope Paul VI claimed the site authentic and each year a traditional service, celebrated by Orthodox and Muslim clergy, honors Mary's Assumption into heaven. Upon reaching the once powerful City of Ancient Ephesus and the Open Air Museum of today, you will proceed on a guided walking tour which is approximately one mile. At the Ephesus Archeological Museum, you'll be escorted through the nine exhibits tracing the religious and chronological history of the ancient city. Filled with attractively displayed mosaics, statuary, and other artifacts, the museum exhibits several marble statues of the Mother Goddess Artemis, goddess of nature, childbirth, and the harvest. You will stop for a traditional Turkish open-air lunch inside the premises of the largest Steam Train Museum of Turkey before continuing the tour. Overlooking Ephesus are the remains of St. John's Basilica, a once great church built on a 2nd century tomb thought to hold the remains of St. John. While the church is now in ruins, there are many frescoes, mosaics and graceful columns that attest to the glory that marked the place where St. John, the Evangelist, lived and died. This site requires stair climbing at the entrance and walking over uneven dirt, stones and gravel walkways. The site has some fallen ruins and some light climbing will be required. There will be time for browsing and shopping once back in Izmir or you can return directly to the ship. This tour requires stair climbing and walking over uneven dirt, stones and gravel walkways. At the Virgin Mary's house there are ten steps, in the city you will walk up/down 22 steps and at St. John Basilica there are 35 steps. The site has some fallen ruins and some light climbing will be required. There will be time for browsing and shopping once back in Kusadasi. Excursions listed for a port may not be available for every cruise. A tour voucher is required for children age 6 and older. No charge for children 5 and under.